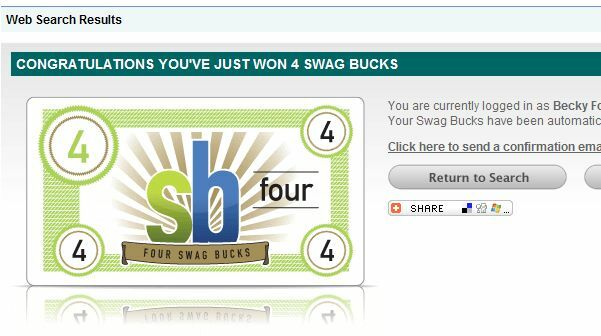 Fridays are Mega Swagbucks Days at Swagbucks.com (aff) — and I just snagged a nice four-buck win when I was using their site to search the web for a coupon code I needed. Got the code and four SB toward my next $5 Amazon redemption. Sweet! They’ve already paid me one $25 Amazon GC and two $5 ones this month, and I have three more $5 Amazon GCs in the queue for payment at the end of the month. It all adds up, especially if your friends search with you and if you set Swagbucks as your home page so you remember to use it frequently! If you’re not a Swagbucks member and would like to join, please click here (my referral link; thanks! ).